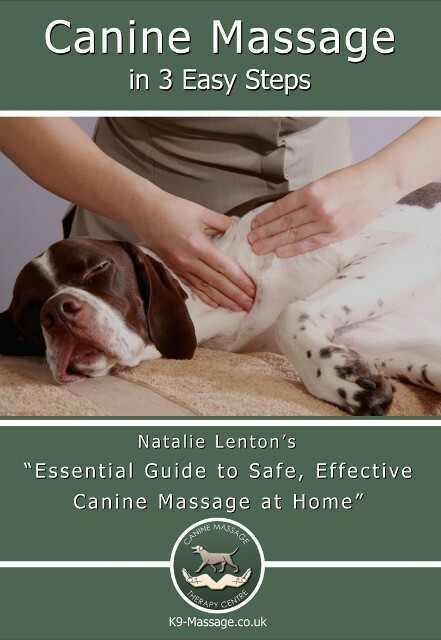 Natalie Lentons’ name has become synonymous with the explosion in the popularity of canine massage therapy. You were one of the first people to set up in canine massage therapy 13 years ago. Tell us about the catalyst for that. Initially I was looking for a career change that would be meaningful, make a positive difference to dogs, and make me happy. The boredom of the corporate world and my background in marketing communications management had, I felt, reached an end. I completed a disappointing basic canine massage course, but I knew, because of my own experiences, it could be more, and set off on a 12-year journey that brings us to today. What experiences are you referring to? How did you develop the Lenton Method® of Myofascial Release for dogs? I started off by finding out what I didn’t want and also recognising what I didn’t know. I reviewed every single course on canine massage in the world and didn’t like what I saw. There was a lot of fluff, not much substance and unsafe working practices. You’ve only got to click on to YouTube now and you will still see that even now. I saw basic techniques taught incorrectly, no emphasis or teachings on orthopaedic and neurological testing for referral back to the vet for further investigations. All in all, people were most definitely not singing from the rooftops about this therapy but mocking it. I decided to, quite literally, chuck everything in the bin from the course I did and start again by myself. It was the only way I could move forward. When I look back now that seems daunting but I think it was a case of ignorance is bliss! I went on to study anatomy and physiology of the human and canine, and studied in many types of human bodywork including direct and indirect myofascial release, sports massage, trigger point therapy, deep tissue massage, DORN method, manual lymphatic drainage and many others. I was lucky enough to spend time with successful human bodywork therapists including, at one stage, a therapist who was working with our Olympic and Commonwealth athletes, so I got to learn a lot there as you can imagine. I practiced palpation skills until my hands hurt, learned different palpation techniques, and finally after 3 years they came alive. I was able to feel everything, it was if my hands had taken on a life of their own and it was a really pivotal moment in my competence as a massage therapist. I now know that what I was doing was developing mechanoreceptor activity in my fingertips and palms and this is now what I teach my students without the pain associated! People who see a muscular health check by a Canine Massage Guild member at a show think its magical, but it is a learned skill and one that takes a lot of years of patience, practice and dedication. It can sort of be likened to braille, your hands are picking up on textures, tones, fascial plasticity, sensitivity and the brain has to be taught what the hands are reading. The dog will also give you physical signs that can be discerned. Being able to read the muscles and the fascia is a true skill, I liken it to where art meets science. I then went on to develop the other stages of the Lenton Method which are Bodymapping and the 7 Protocols. A well-respected type of bodywork this can be likened to in the human world is called ‘’Rolfing” which produces the most incredible profound results. Dogs wouldn’t be able to tolerate this so I created a set of direct myofascial releases to the suit the comfort levels of the dog as well their anatomy. Essentially it is classed as structural integration of the entire body of the dog to reduce or eliminate pain and improve movement and behaviour. It was a very creative and very special time, the dogs taught me. I listened. Why did you decide to go into providing training for future therapists? People started saying ‘I want to learn to do what you do’, they were fascinated with the method, they didn’t know what they were seeing, they just knew, ‘it wasn’t like normal massage’. I recognized that one person can only help a few dogs and that the knowledge should not stay with one person if the dogs were to be helped with this therapy. What advice would you give to someone interested in training in canine massage? Research your course carefully and speak to your potential tutor. Watching YouTube videos and reading a book doesn’t count for much when it comes to a practical skill that requires manual dexterity, so be sure to have a go at a workshop or similar first. Go for massage yourself and experience different styles and the benefits, you can’t be a competent therapist without it. Before learning the Lenton Method we teach our students 4 other disciplines of massage which are sports, Swedish, deep tissue and indirect MFR and I will place the expectation on the student to have these done to themselves before coming into my classroom for practical sessions. Practice what you preach. Live your story. My course isn’t for the feint hearted, it’s hard, its challenging both physically and mentally and there is a lot of responsibility to the dog, owner and vet. We ask our students to leave their egos at the door, this is all about the dogs. You established the association the Canine Massage Guild in 2010, that’s a big step. Tell us about it. I was asked by my first students to set up an association in 2010 so I did. In 2013, it had already got bigger than I imagined and I gifted it to a Committee. Now its run by its members for its members who are all self-employed therapists with their own identity who see the bigger picture. They work on their own businesses and support each other under one umbrella, I wanted it to be like a cooperative where we all work towards the same goal. They’ve taken it forward and they are amazing, they now inspire me. There’s now over 100 members across the UK, Spain, Ireland treating thousands of dogs with this therapy. What’s next for the Canine Massage Guild and the Canine Massage Therapy Centre? We are just in the middle of the worlds’ first clinical trials on Canine Massage and specifically the Lenton Method, as its important to differentiate it from ‘strokey strokey’ types of massage. We are working with Winchester University and Sparsholt University Centre on 2 different phases of trials. Next year we go to the gold standard of onsite double blind trials with over 50 participating dogs and owners. 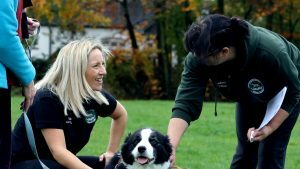 The Guild have also just launched something called the Integrated Veterinary Care Initiative which is the educational bridge needed between clinical canine massage and individual veterinary practices. Change occurs through education, so that’s the impact the Guild will be having in the next couple of years as this therapy continues to become more accepted and mainstream. What’s your main inspiration for this work? Seeing dogs have quite literally life changing results, living longer and being more mobile and happier. Seeing students change their lives too, as they become therapists and move away from the jobs they hate, to a career they love. My number one inspiration though is my best friend ever, Pip my Jack Russell. She is the reason this all started and has gone as far as it has. The business is another expression of my love for her because it was her that changed my life. I now help others express their own love for their dogs and passion for working with them in their businesses. I’m pretty proud of that. For chronic pain management, soft tissue injury rehabilitation, and orthopaedic and neurological condition support, clinical canine massage blends myofascial release (MFR), both the direct and indirect approach, sports massage, deep tissue massage and Swedish massage. It also incorporates the trademarked MFR protocols from the Lenton Method®, a three-pronged approach that incorporates advanced palpation skills, BodyMapping (an actual map of the body that is used to determ ine common areas of muscular injury and issue as well as myofascial pain developed over the course of 10 years) and ‘The 7 Protocols’, a unique set of myofascial release techniques that produce long lasting results. 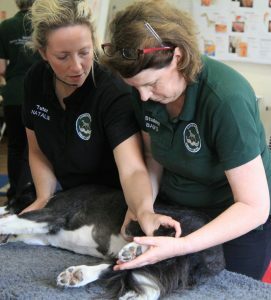 The initial Clinical Canine Massage Practitioner Programme is delivered by the Canine Massage Therapy Centre Ltd. over a period of 2 years and it is externally accredited by LANTRA. Upon completion and pass of written and practical examinations therapists are able to join the Canine Massage Guild and commit to Continuing Professional Development (25 hour/year minimum) provided exclusively by CMTC for Guild members including manual lymphatic drainage, facilitated stretching, skill reviews, neuromuscular refacilitation, ventral MFR and other clinically appropriate bodywork courses. Animal welfare, consumer protection, clarity of law and professional standards are the Guild’s core values alongside providing the best service possible to dogs, their owners and vets. The online therapist register includes members from the UK, Ireland, and Spain.